This weekend was fantastic, I had a blast and, as a result, today I’m totally sleepy at work. This is becoming a new trend, weeks are to rest from the weekend… I’m loving it. Friday night I went home earlyish, and met with Meru-San and a few others for dinner that night. After dinner I went back home and at some point at around 12:30-1am I went to bed, just so I could wake up at 7:00am to meet up with Ben-san and Sharps-San at 7:35 am by the station and head over to Himeji! On the way there we met with Meru-San in Sannomiya Station, and then with Ashley-San in Himeji. We were now the fantastic 5, cause 4 were not enough. Once at Himeji we went to the Himeji Castle, which, if you remember the Osaka Castle, this one was twice as awesome. The castle was big, as in big big, and it had something new to see every time you turned around. For some reason there were some big, open spaces that inspired me to kick. I just wanted to kick, and so I did. Unfortunately there were no TKDers with me to kick paddles, but that’s exactly what I felt like doing. Now that was epic. We had ice-cream before all this, so we couldn’t stay still. After that we went to see the biggest suspension bridge in the world, then had dinner, and finally after that returned home. The arcade was so cool, Koji-San won on our Mario Kart race. The lunch was so delicious I’m still crying of happiness. And the parfaits, oh the parfaits. That was happiness inside ice-cream. You can ask Meru-San. There are pictures posted on facebook of both the trip to Himeji and the Sunday trip around Osaka. The link to the pictures is HERE. Enjoy! Another week about to end! It’s Friday again! I’m surprised at how fast this week went by, mostly because I actually have not worked all that much. The thing is, Monday night I was really tired for some reason, and I slept a lot, but I woke up Tuesday morning not feeling well… I went to work and by 4pm I was on my way back home. I had fever & stomach issues (insert very sad smiley face here). I spent all Tuesday afternoon cleansing my system, eating nothing but a bit of bread and rice, and drinking a whole lot of Pocari Sweat and some of THIS, which made me really feel better. Wednesday morning I just had a little fever, so my body wasn’t weak or hurting anymore, but I still had quite an upset stomach. My stomach was fierce. It was kind of sad… I spent all day at home just recovering. Since all of Wednesday was spent at home browsing the internet and resting, it messed up my perception of the week. Thursday I went back to work and realized, “oh my god it’s THURSDAY!” The realization that the weekend was about to arrive hit me strong and I just got so psyched that the day flew by. Today is Friday and Meru-san is coming to Osaka to a conference/meeting, and then we are going to hang out! It’ll be fantastic. I’m looking forward to it. Another thing I’ve realized is that a lot of mothers take their kids to day cares on bikes. It’s awesome to walk to campus in the morning and see all these mothers arriving in front of the day care on their bikes and the kids sitting behind them in the child sit. These kids are not really all that ‘secured’ so to speak, I’m pretty sure that if the kid wanted he/she could set themselves free. I’m quite sure cause I saw a mother stop, put both legs down to balance the bike and say to her kid: “Okay, go!” and the kid just jumped out of her seat! I was like, WOOOO! That’s a kid, right there! After writing my last post I returned home last Thursday, and basically just went to sleep. I went home a bit later than I was hoping, as usual, so I decided to get my schedule straightened out Friday. Friday I discussed what I had to do with my post-doc, and made the decision to not come-in on Saturday, and instead store my cells in the freezer for a few days and pick a colony Monday instead of Friday. The reason? If I had agreed to come in Saturday it would end up in a vicious cycle in which I never actually work normal hours. My schedule is supposed to go from 9 or 10am until 5 or 6pm Monday through Friday, and that’s what I’m planning to work. Osaka is such a great city, I really want to keep exploring it and meeting people. That being said, Friday afternoon I left lab at 5:30ish and went home for about an hour (after an hour’s commute) and then went to Umeda to meet up for dinner with Koji-san (the one sitting on the far right in this picture.) Koji-san and I had really good takoyaki, and then a delicious bowl of ramen in a set that included rice with some sort of ‘beef’ over it, I think. It was all delicious. Afterward we walked around Osaka, which was nice, and we went into a CD/DVD/BOOK shop and I saw a lot of Michael Jackson in there. Saturday was my day of staying at home and receive my Wireless Internet Card. If you did not know, I used to access the internet only at work. As a good MIT student, I grew used to having internet access 24/7, and then suddenly only being able to use it at work, and have no working phone, I was just about to panic. I ordered this wireless card that I have to pay around $60 a month for it, but it gives me unlimited wireless internet access. The card uses a signal from e-mobile, the celphone service provider, so I can use it anywhere they have service, quite good! I spent the rest of the day browsing the internet, calling home through Skype, and just relaxing. Sunday was a more eventful, after waking up a bit late, I cleaned up a bit and relaxed. For dinner, however, I met with Zhang-san and his friend and business partner Yatani-san. We had a pleasant dinner at a Chinese restaurant down in Osaka. The dinner and the conversation were great, and it went on for over 4 hours. There were several good things we talked about, mostly surrounding businesses and IT, but also friends, family, and life in general. Both of them were quite pleasant to talk to, and I had a great time. They also told me about something I had heard about, but had not done much about, and it is related to my Japanese name. This does not really make for a good image, particularly when working in business, so I got the recommendation to instead use my name as Omaaru 「オマール」, with that extra ‘a’ sound, even if it does not resemble my original name in Spanish as much. Doing so would prevent people from thinking about potty training when they hear my name, and this name I could write in Chinese characters as 御真阿留 which has a great meaning. I am very grateful and happy about our meeting last night, and I’m looking forward to meet with them again. They are both very smart young guys, and they both have a very good vision of what they want to do/achieve, which I admire greatly. Their recently founded company, SSQQB, has a lot of potential for growth, particularly because of their attitude and vision. I definitely am looking forward to learning more from them. Monday at around 11:30 a.m. I received an email from Kimura-taisho, the president of Webshark. I replied right away because I was looking forward to meeting him that night. And how did I get to meet Kimura-Taisho, you may wonder? During the fall term last year I started attending the MIT Japanese Lunch Table. The Japanese Lunch Table allows students to talk to Japanese people and do a language exchange. There I met this young, nice Japanese guy. After a good first impression, I decided to talk to him. Masato-san was his name, but his friends call him ‘Masa’. He graduated a few months earlier and was in Boston for 6 months to improve his English. Once he was done, he would return to Tokyo and start working for Morgan Stanley. He was an interesting guy, and it so happens that he was looking for a language exchange partner, so we agreed to meet again. We met a few times over the next few months. We talked about many things, from basic things like “American food is so bad” to more complicated topics like business, family, and friends. It turns out that Masato-san had started his own businesses while he was in college, and he even managed to sell two of them, He was an entrepreneur and quite a good one. I was excited to learn about this, so he told me a bit more about his businesses. It was great to hear about it, but I couldn’t quite grasp how you could simply go out there and make a business. It seemed harder to me than what he was telling me. After a few months having fun together, Masato-san had to return to Tokyo last March. Once I got to Japan, Masato-san e-mailed Kimura-Taisho and asked him to meet with me. The story of how Masato-san met Kimura-Taisho is also interesting. Masato-san simply reached out to Kimura-Taisho out of the blue through an online social network. Masato-san was genuine in his interest in wanting to get to know Kimura-Taisho and learn from him about business. Kimura-Taisho was intrigued and agreed to a meeting. Now here I was, about to go meet Kimura-Taisho, thanks to a friendship I made with a guy who had the courage a while ago to email this CEO out of the blue to meet him. I got to Taisho’s Company Entrance at 7:55 pm but the front door was locked, and I was not expecting that. I was in a small room right off the elevator waiting to see if someone came out through the front door and I could then say something. There was a little phone on the corner, but what could I do with it? I didn’t understand the Japanese written on the card next to the phone. It had, however, the number 37 written on it. At 8:02 pm I realized no one was coming out of the office so I dialed the number, but then hung up cause I didn’t know where I was calling. A minute later a young girl opens the door and lets me in. I explained in my limited Japanese that I was there to see Kimura-Taisho. She nodded as if she were expecting me. I guess it’s not every day that a foreigner shows up at their front door. She directed me to the waiting room. It was a nice room, well-lit, with nice furniture and a glass table I loved. The young lady closed the door when she left, but then came back in with a cup of tea. I thanked her and took a sip. Withing a minute or so Kimura-Taisho, the CEO, walks into the room with two other guys and enthusiastically greets me: “Omar-Kun!” His friendly and lively tone would have fooled anyone into thinking we already knew each other. He shook my hand and introduced himself right then. Since it was raining Kimura-Taisho made sure I had an umbrella and then we headed downstairs. He asked me what I liked to eat. I was good with anything, I said. Sashimi it was. We went to a place nearby, a quite nice Japanese-style bar and got a table for the four of us. We talked, had a few drinks, and a lot of delicious food. I was impressed by Kimura-Taisho, a man with no college degree who started multiple companies and made a living out of it. When I asked how he started his business the story was quite intriguing and interesting. The key to success in business, he said, was knowing how to ask people for favors and who to ask. Kimura-Taisho needed to implement a website, but he had not learned any programming. He had two options, sit at home and learn to program, or go out find someone who knew what he was doing and ask him to do it. In this case, “give up easily”, was his secret to success. Instead of sitting at home and learning how to program, he found a guy with 8 years of programming experienced and they worked together. By knowing who and how to ask, he had already saved 8 years of work that he would have needed if he tried to learn the skills this guy already had. A great businessman surrounds himself with smart people who can do the things he can’t do. Give up easily. Know what you’re good at and do that, find people to do the rest. If you need a website for your company, but you’re only good at managing a business, focus on managing the business and let someone else work on the site. Be humble and nice. Be always interested in what others had to say and quickly notice the good things in others. He embodied this throughout the dinner. Friends and family come in first. What’s the meaning of money if you don’t have friends? This night really made an impact on me. This weekend was the MISTI-Japan Kyoto trip in which all the Japan interns went together to explore the ‘old capital’. It was one of the best weekends I’ve had, ever. Not only we had a great tour, visiting many beautiful and impressive temples, the food was also delicious and I met a lot of young, nice and energetic Japanese people. This really made the difference, particularly because Meru-san, Kim-san and I spent most of our time with two Japanese guys and we had a blast together. My great weekend started Friday night when I left work at 7pm, the earliest I’ve ever left. It felt great to leave work while there was still some daylight. This made me seriously consider talking to my boss about my schedule, cause I don’t really think I’m expected to work until late (~10pm), especially since I come in at ~9am every day. I’m going to actually set the times I work in stone cause I know my MIT friends are working ‘regular’ work days, 9-6pm ish. Working a schedule like this would allow me to enjoy the city and meet more people. I love the people in my lab, but unfortunately most of them are too busy with their science and we can’t even manage to grab lunch or dinner together more than once a week. Friday at 8pm I met Meru-san at the Juso train station and took her to Juso Ramen. I ordered something different from what I always order, and it wasn’t as delicious, so I’m going back to the usual next time. Meru-san had a regular bowl of ramen, and according to her it was good. That probably means it wasn’t delicious — maybe there is only one delicious bowl of ramen there. After dinner we went to the conbini, and then we returned to my apartment. Once there we tried to figure out how to tie the obi in one of her kimonos, but that didn’t particularly work out. There’s a reason why they had geishas go to school back in the day, knowing how to tie a kimono was probably one of them. After taking a couple of pictures and having some fun, we went to bed at around 1am so we could get early in the morning. In the morning we took the 5:30ish train from Juso to Umeda station, and then the 6am train from Osaka JR station, to Kyoto. The whole trip was less than an hour. Anyway, once you walk into the room with all the people naked there are plastic ‘seats’ that are no taller than 1 foot and you just go sit on that. You shower by filling with water a bowl using the water faucets in front of you, and then there is shampoo and body wash on the side. There is also a mirror one or two feet above your head level at an angle that allows you to see yourself easily. Once you’re done with that, then you can go in to the ‘communal bath’, which is pretty much a big jacuzzi. It was quite hot, so must of us were out of there within 10-15 minutes. After our magnificent bath (Japanese onzen) we we got on a bus and saw a few temples. We visited Kinkakuji (Golden Pavilion), Daitokuji and Heianjingu before lunch. Then we visited the Kiyomizu Dera Temple and some other temples I can’t remember. Lunch this day was at a really nice Japanese restaurant, I’m sure it was the most expensive lunch I have had up to that point. I had a tempura set and it was delicious. Dinner was probably even more expensive that lunch — I had a sushi set that also included tempura and a few other things. Both lunch and dinner included either a bowl of rice or noddles, and even that was very delicious. The food was so delicious, and the best part is that it was all paid-for by MISTI-Japan so I didn’t have to spend my money on that. During the temple visits I talked to about ~6 Japanese people who joined us in the trip. These folks were somehow associated with the people in charge of our tour (worked in their company, or university, or something similar) and they were there mostly to practice English. The flaw in this plan, however, was we the MIT students were there trying to speak as much Japanese as possible, so our interests were not really compatible with theirs. Meru-san, Kim-san, Ben, and I spent most of the day with these two Japanese guys which were pretty much our age and were quite good at English. This allowed us to communicate fairly well cause they could throw in a few words in English when we were confused by what they were saying. They had a great spirit and were very friendly and interesting. Our conversations flowed from talking about MIT, to talking about Japan, and all the usual things. Then we started learning kansai-ben, which is the dialect spoken in the ‘Kansai’ area. Something I learned is that, apparently, the reason why Japan has two areas, one called ‘Kansai’ and the other ‘Kanto’, is because Japan has a lot of mountains (which are non-developed areas), and there are two regions in which bigger cities have been built. Kansai and Kanto are those two regions. We learned quite a bit of Kansai-ben that day, and would use it all the time to practice. I think we might have used it a bit in excess, but it was just too much fun. In return, we taught the Japanese how to say a few things like, “this is freaking awesome”, “this is tight”, “sweeeeet!”, and other similar phrases. It wasn’t a fair exchange cause they taught us more things, but they learned a few things and were quite good at using them. A pretty great thing was hearing them randomly say “oh my god, this is frlikin osom”. Saturday after dinner we went to Karaoke! That was, pardon for the repetitiveness, freaking awesome! We went in a group of 8 people, 6 MIT kids and the 2 Japanese, and we were all pretty much on the same page. It was a very high energy group and we sang a wide range of music. We opened up with “Thriller” to commemorate Michael Jackson, and then sang music from Utada Hikaru, some other Japanese folks, Britney Spears, Aqua (Barbie Girl), Backstreet Boys, Muse, etc. I must say that karaoke was amazing. I left the place with my throat feeling just the way it does before you either lose it or start speaking like a 60-year-smoker. In the morning I discovered that in my case it was the latter. I woke up and when I said hi I felt like I was about to give the news on the radio. JKim quickly let me know that even though I had such a deep voice, I was basically a girl in her eyes because I was telling her about all the face products that I’ve been using to keep my skin clean and almost acne-free. I could feel the love. After karaoke Saturday night we returned to our hotel room at around 1am and just got ready for bed. The hotel room was actually quite nice and I found an ethernet cable that happened to give you free internet access. Of course I spent about an hour online. After sleeping about 5 hours I woke up today at ~7am to get ready to go to more temples. We first took the train to Nara, which was just one station away from our hotel. Once there, we went to the Nara Koen park and walked through it to get to the Todaiji Temple which was amazing. We had a lecture by a Buddhist Monk about Buddhism and Shinto (the other main religion in Japan) and he told us a lot of things about the temple. 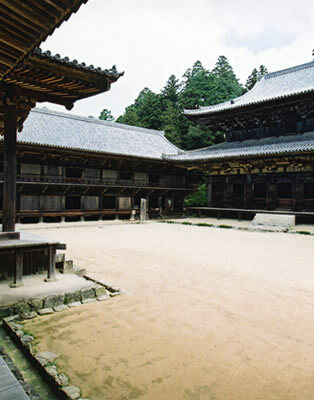 There was enough wood in that temple to build 15,000 houses in Japan, and the temple was actually 1/3 of the size of the original temple. I looked at the temple in disbelief, it was enormous and I was being told that it was originally 3 times bigger! After the lecture we were taken up to walk around the platform on which the Japan’s largest Buddha statue is on. Not many people get to go up there, so you could see a lot of people looking at us a bit puzzled by why all these foreigners were walking up to a restricted area. I was very grateful for the opportunity because it really allowed me to appreciate how big this statue was. To give you an idea, there is a big pole that has a hole made on it that is the size of the nostril in Buddha’s statue. Most MIT students in the tour were able to fit through the hole. After feeding the deers we had the lunch which was めっちゃ美味いわ, or ‘too delicious’ in Kansai-ben. After lunch we then returned all the way to Kyoto, and then I returned to Osaka with Meru-san, Ben, and Koji-san (one of the two Japanese guys we went to Karaoke with). Sadly, Naoki-san, which is the other Japanese guy, couldn’t join us on the second day of the trip because he had other things to work on. Both Koji-san and Naoki-san were extremely nice and made the whole experience a lot more fun than I would’ve imagined it to be. They both study in the Osaka area, so hopefully we can meet again sometime soon. We did talk about going karaoke again at some point in which Kim-san can hopefully come to Osaka (she’s in Tokyo for the summer) and Meru-san can come from Kobe (which is less than an hour away). I’m quite grateful for this weekend, and if we could all get together again I am sure it would be great. I think we might go see the fireworks together (which happen at different times all over Japan during the summer), so that should be fun too. Overall, I think the best part of this weekend was the high-energy of the people I shared most of my time with. I was called by the Japanese “the high-energy one”, but I must admit I was particularly happy/excited this weekend because of the people I was with. We simply had a great time together while going through the day and I probably have more good memories about the 6ish of us joking around, having fun and doing karaoke than anything else. I must point out that essays 1-3 should be 400 words long, and essay 4 should be 600 words long. This means that I have to cut down 81 words from here and there, which is why life is exciting during work hours. 🙂 I’m currently waiting on some feedback from friends, and after I get that I will work on re-editing my essays more and more. I’ll keep polishing them, I find a certain satisfaction in doing so. It allows me to reflect on my life, my goals, and why I have such goals. The experience of writing this essays has, by itself, been such a grace that it makes the whole application process worth it already. That being said, I had ramen from a different store the other night, it wasn’t as good as my usual bowl at Juso Ramen. Don’t get me wrong, it was delicious, but compared to Juso Ramen… maybe I’m just in love and can’t seem to find any flaws, but I simply love that freaking bowl of ramen. I can’t wait to go get it tomorrow. That being said, this weekend I’m going to Kyoto! I’m joining 30 other MIT interns in Japan in a 2-day trip to Kyoto that will allow us to explore the old-capital. If you didn’t know, Kyoto used to be the capital of Japan, and that is why there are so many temples and beautiful things to see there. Back in the day, when Buddhism was introduced to Japan and Shinto was already in place, they coexisted in harmony, but each built as many temples as possible to establish their presence. Talk about passive-aggressiveness. Anyway, I want to see a geisha. Not any geisha, the one from “Memoirs of Geisha”. Or Sei Shonagon. The only problem is that… yeah, exactly, they are nowhere to be found unless I move into the spiritual realm somehow. Since we’re going to Kyoto this weekend my friend Carmel, who just graduated from MIT, is going to stay over at my apartment the night before! She is arriving tomorrow at 8pm-ish so guess what I’m planning? Guess where I want to take her to eat dinner… That’s right, when she gets off that train in Juso she will get out of the station, cross the street, and have dinner with me at Juso Ramen. And no, I did not consult with her about this, but yes, that’s how things work. If not, she can have dinner from the conbini after I’m done with my bowl of ramen. Just kidding, I would take her somewhere else for dinner! So that is pretty much what has been going on in my life. Lots of internet browsing, lots of reading on the train while commuting, and that’s about it. I’m reading “A New Earth“, which I keep calling “A Whole New World”, and it’s an excellent book. Everyone should read it and see if they can be enlightened. After all, Oprah recommends it. A Weekend of Essay Writing, and Going Out! Anyway, Saturday I woke up at around 11ish and had lunch at the sushi place down the street where the sushi just goes around. It’s called Kaiten-Sushi (回転すし） literally rotating sushi. It was quite good. After lunch I just went back to my room and wrote and re-wrote my essays for the HBS 2+2 application. At around 9pm I decided that I was tired of rewriting essays and watching TV and headed to dinner (ramen). I must say, though, that Japanese TV is quite interesting. I don’t know if the ~15 channels I get are representative of what people like to watch in Japan, but I’ve seen a couple of funny things. There’s 2 channels that are just there to sell you things, and these two women were talking about this ‘massager’ that would be perfect for your neck, the back of your EAR (yes… my ears are quite tense) and as she used it she would exclaim how good it felt. I don’t know if they were trying to kid anyone, but that was no massager. At least not for the body parts they were saying. Anyway, something else that was quite interesting was watching Terminator in Japanese. All I could think the whole time was like: “There’s NO WAY that girl knows Japanese. And Arnold Schwarzenegger, he also doesn’t know Japanese, come on.” I thought it was funnier than anything else. So we went to the bar, and this is something about Japanese bars, they are probably twice as big as my apartment, and that’s not too big. You walk in and immediately everyone knows you’re there, and you know who is there. No mystery, and no way to hide. Anyway, I had a few drinks and met a couple of people. I actually met two people from Perú! Who would have thought, I came all around the world to Japan and I find Spanish-speaking people. It was nice to just speak Spanish when even in America I don’t get to speak it all that often. At around 4:30am a few people I met, my friend, and I headed out to get some food. It was a good ‘after partying’ meal. It went on until about 5:45am, when we decided to head to the train station. It was funny to see all the people that were migrating to the train station at that time. You could see these girls/women wearing their fabulous dresses and with their make-up messed up. It was great. Also, according to my friend JKim, in Tokyo when she went out she saw that at around 5am one of the employees in one of the food places was waking up a bunch of people who had fallen asleep there while eating. Awesome, right? I finally got home at around 6:30am and then showered and got to bed by 7am. Woke up at 1pm, had something from the ‘conbini’ and then edited my essays a bit more. After that I had dinner (ramen once again, they were good, believe me) and then at around 6pm I couldn’t wait any longer and fell asleep… I woke up at 11pm and then just went made a few calls (through Skype, of course) and got some midnight snack from the conbini. That conbini is so convenient, oh yeah, I wish we had those in all corners in Boston. They are pretty awesome. America should replace Dunkin Donuts by Mister Donuts, and 711 by Family Mart and Lawson. Anyway, I finally went back to sleep at round 2am and woke up at 7:40am cause I had to be in lab by 9:15am. I got to lab by 9am, which was nice. In lab today I confirmed that no, I don’t understand scientific papers presented in Japanese, and yes, I am now the official mopper here. When it was time to clean the lab I basically just went and picked up the mop and started mopping, cause that’s what I do best. I then did some cell passage, sent in my essays for criticism, and then went to lunch. Lunch was good, and cheap. I then prepared some samples for an SDS Page Gel, ran the gel and did silver staining on it. Now there is another beautiful gel on my post-doc’s lab notebook as proof of the hard work I do in lab. It’s actually the first time I do something useful in three weeks, I think. Okay, that’s my weekend report. There are probably a couple of things missing from my weekend reflections, but that’s alright. Next weekend is the Kyoto trip! That should be awesome.